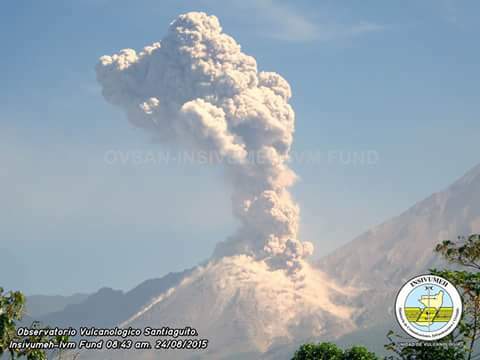 Santiaguito (Guatemala): (25 Aug) A stronger than usual explosion occurred yesterday morning at 08:43 local time, producing a plume that rose approx. 2 km above the lava dome and generated small pyroclastic flows. Cotopaxi (Ecuador): The eruption continues with similar activity as during the past days, with a gradually increasing trend. Accompanied by near-continuous tremor, the volcano now produces almost constant, dense ash plumes rising up to 2 km and drifting into westerly directions, reaching the Pacific Ocean. The current phase of near-continuous emissions started during the night 22-23 Aug, when volcanic tremor appeared suddenly at 21:41 local time. The next day, after 18 hours, 2 mm of new brown ash fall had accumulated on the western side in the Cotopaxi National Park. During yesterday, a gradual increase in tremor and seismic energy were detected, corresponding probably to increasing internal pressure, and an increase in the volume of magma rising towards the surface. The height of the ash emissions also gradually increased to approx. 2 km. Piton de la Fournaise (La Réunion): The eruption that started yesterday continues, but only one of several fissures (east of the Rivals crater), that opened last night remains active over a length of 100 m. A small cone has been built at its upper end, approx. 140 m east of Rivals crater. Strombolian activity occurs from this vent, while 3 other vents lower on the fissure continue to produce lava fountains and feed a lava flow that slowly advances towards the Grandes Pentes.